The teaser of Shanthnu starrer Mupparimanam was released yesterday, 20th of July and the teaser has opened to good feedback from not just the audience, but also from industry insiders and stars. 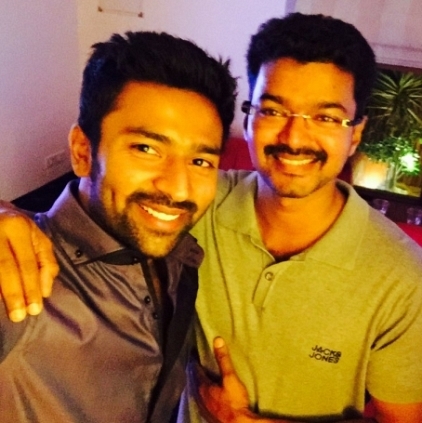 It is known that actor Vijay and Shanthnu share a very good rapport. Looks like Ilayathalapathy shared his feedback about Mupparimanam’s teaser to Shanthnu through a message. A joy-filled Shanthnu tweeted this morning sharing his happiness, “Woke up to this msg"Awesome teaser Nanba,GoodLuck" frm my bro @actorvijay Therrri baby”. Mupparimanam stars Shanthnu Bhagyaraj and Srushti Dange in lead roles, while it is directed by debutant Adhiroopan and has music composed by G.V.Prakash Kumar. Will Vijay Change His Policy For Sundar C's Sanghamithra? People looking for online information on Mupparimanam, Shanthnu, Vijay will find this news story useful.